I’ve been reading about Miller’s Smokehouse up in Belton, Texas for the past few weeks from the scribes at Full Custom Gospel BBQ and Texas Barbecue Posse. The men behind those barbecue websites were amped up about Austin, Texas quality barbecue being available in Bell County, an hour or so north of Travis in which Austin sits. One of my friends took me up on a barbecue roadtrip offer and we rolled up there this past weekend. The muscle behind the outfit; Robert Reid and Dirk Miller are taking their barbecue very,very seriously. 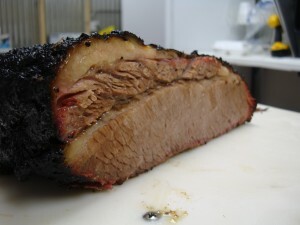 This entry was posted in Rural Texas, Texas Barbecue, Texas Barbecue Photos and tagged Austin, barbecue, BBQ, best barbecue, Brisket, central Texas hot guts, Pork Ribs, Restaurant, rural Texas. Bookmark the permalink. Rachel · This is so yummy! I made it tonight and did one with tomatoes, green onions and green beans and another with regular onions and chorizo. (I don’t eat cheese.) However, the bottom of the crust toasted a lot even on the non-stick pan that I sprayed. It completely stuck but I was able to spatula-off the middle layer to enjoy my pizzas. Any suoisstggne? Thanks!